Many people say they have faith in Buddhism and therefore naturally regard themselves as Buddhists. However, these numerous Buddhists who regard themselves as having faith in Buddhism are at many levels and a mixture of true Buddhists and false ones and have all kinds of people in them. Among them, there are people who truly believe in Buddhism and have the correct faith, there are people who regard themselves as having the faith but really do not have the correct faith, some falsely claim to have the faith, and there are descendants of Mara Pipiyan who infiltrated into Buddhism to do damages. That is why the Buddhist world is full of chaos in this dharma-ending era. This situation requires true Buddhists and Buddhist disciples with the correct faith to open up their eyes to clearly distinguish what is true and what is false and determine what is right and what is wrong, in order to advance on the correct Bodhi path toward liberation and accomplishment without deviating aside. There is only one way to achieve that goal. That is, taking the dharmas of the Contemplating the Magnificence of Perfect Prerequisite Oceanic Mind Essence and the Most Magnificent Bodhi Dakini Oceanic Mind Essence in the Supreme and Unsurpassable Mahamudra of Liberation and What Is Cultivation expounded by H.H. Dorje Chang Buddha III as the guiding compass for absolutely correct cultivation, earnestly learning from and studying the dharma Expounding the Absolute Truth through the Heart Sutra expounded by H.H.Dorje Chang Buddha III, and diligently listening to the recorded supreme dharma lessons expounded by H.H.Dorje ChangBuddha III. Buddhist is a noun with broad meanings. Within the scope of this concept embodying a wide range of meanings, quite many people are really just “followers” or even “visitors paying the respect of burning incense.” Their knowledge about Buddhas and Bodhisattvas is just knowing the concept. 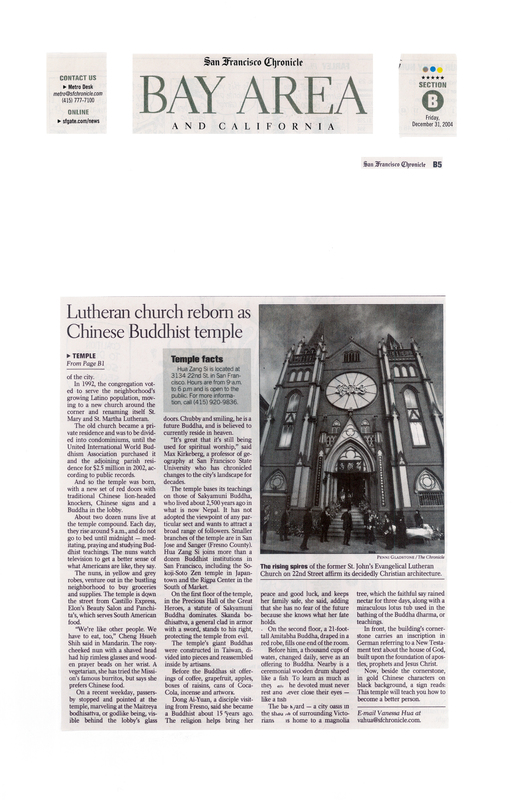 They only have the so-called faith in Buddhism but have not taken refuge or made deep study or investigation. Basically, they are still invaded and corroded by the three poisons in their daily life, do things based on their own opinions, and do not cultivate or practice in accord with the Buddha’s teachings and warnings. When they go into temples to burn incense and pay respect, they beseech only rewards of good fortune in the current lifetime such as making big money in business, getting promotion or advancing to a position of power, happiness and harmony in family life, good health, and so on. Some of them cannot even tell the difference between Buddhism and Daoism and pay respect to deities and ghosts as well. That is absolutely a false faith in Buddhism without any understanding. Therefore, strictly speaking, such “Buddhist followers” really cannot be regarded as Buddhists. There are also quite some Buddhists who, though having taken refuge in Buddhism, have not become clear about the approach of learning the absolute truth of Buddha-dharma and practice Buddha-dharma selectively as worldly ways. Some of them even have incorrect or evil knowledge and views. Their cultivation falls into superficiality and becomes a futile effort. They think that believing in Buddha’s existence and having taken refuge in Buddhism are the entirety of a Buddhist’s faith. Their faith in Buddhism is not a pure faith and is not an indestructibly firm faith. Their faith is a “faith that can be overpowered,” which can be easily shaken, overpowered, and abandoned. Their faith is an “intermittent faith.” They sometimes have faith and sometimes have doubt. A slight disturbance can cause them to generate doubt, enter into delusion, and lose confidence. Their faith has reversals and impediment and is not always clear and pure. This type of cause from such impure and contaminated faith definitely cannot bear wonderful fruit of accomplishment and liberation. This kind of faith has an extremely weak foundation and of course is not a true faith. 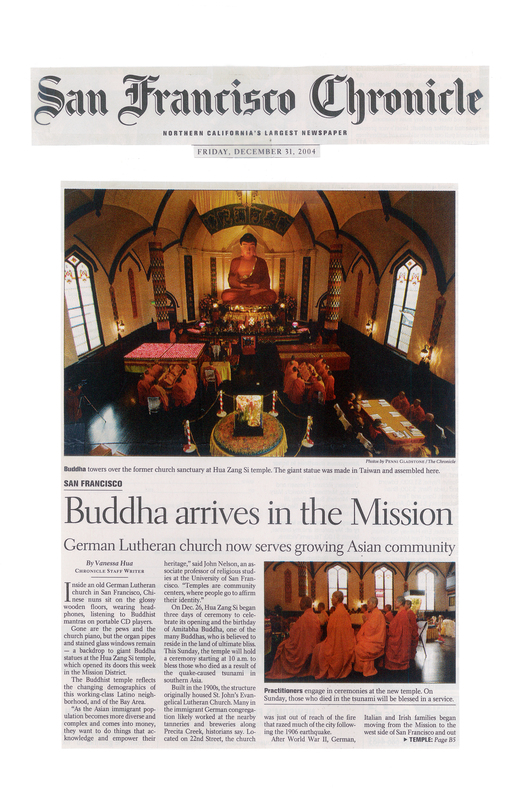 Therefore, the refuge ceremony they have taken is just a formality and cannot represent a true faith in Buddhism. One who does not have a true faith of course will not have a correct understanding and will not put the faith into action. Therefore, these people will not clearly believe in cause and effect and will not truly know impermanence, much less fear impermanence. Rather, they have deep and severe attachment to the self and always treat things related to them as important and having a higher priority than Buddhist work. They may even list conditions and offer deals to Buddhas and Bodhisattvas to ask Buddhas and Bodhisattvas to give them what they want first before doing Buddhist work. How can such cultivation and conduct receive protection and empowerment from Buddhas and Bodhisattvas? How can there be benefits and rewards from learning Buddhism to speak of? Thus, in today’s world, although countless people claim they have faith in Buddhism and cultivators of Buddhism are numerous and everywhere, very few of them can truly receive beneficial rewards. Instances of ending the cycle of birth and death are even rarer. Shouldn’t this situation cause the attention and vigilance of Buddhist disciples learning Buddhism? 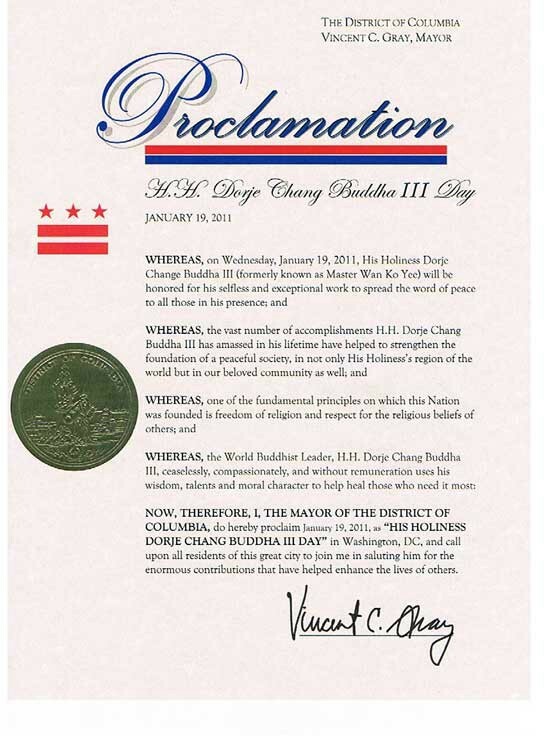 The goal of believing in and learning Buddhism is for attaining liberation and accomplishment and becoming a holy one. Therefore, Buddhists questing for liberation and accomplishment should strive to plant and grow the cause of true faith to get the wonderful fruit of liberation and accomplishment and let themselves become veritable disciples of Buddhism with true faith and correct faith. Then, where does true and correct faith come from? Of course it comes from piously cultivating Buddhism through concrete steps. Buddhists with true and correct faith should believe in not only the Buddha’s real existence but also the Buddha’s teachings and precepts, develop strong power of vow from the inner mind to uphold, follow, and carry out the Buddha’s teaching, develop the power of determined faith to regard the principle of Buddha-dharma as the sole standard of selection and the guiding principle of conduct, and strictly and firmly act in accord with the teaching to generate the power of true faith from the inner mind. With such premise, we can establish the determination to cultivate Buddhism, clearly believe in cause and effect, diligently practice the ten actions of goodness and the four limited states of mind, and broadly cultivate the six paramitas through all acts. On the other hand, a person who is deeply plagued by heavy attachment to the self and only superficially obey Buddhas’ and Bodhisattvas’ teachings and precepts will never step onto the path of Bodhi toward liberation and accomplishment even after reading the Tripitaka exhaustively. Therefore, disciples of Buddhism who truly intend to cultivate Buddhism to attain liberation and accomplishment have to become Buddhist disciples in the holy sense with true faith and real cultivation. Buddhist disciples in the holy sense are in true correspondence with the Buddha’s teaching and the purpose of learning Buddha-dharma and can thoroughly see the true such-ness of mind nature. Such is the meaning of the holy sense. To possess the status of the holy sense, Buddhist disciples must concurrently pursue progress in all three aspects of Buddhism. Only by advancing in all three aspects coherently as a whole can one be regarded as a Buddhist disciple in the holy sense. These three aspects are: the teaching of Buddhism, the study of Buddhism, and Buddha-dharma. Moreover, the three aspects must be combined perfectly to comprise one entity. The teaching of Buddhism includes the Buddha’s teaching that has been transmitted through the time and historical facts about Buddhism. Among them, there are true events of the Buddha, historical backgrounds, records of the origin and propagation of Buddha-dharma, karmic conditions related to expounding specific dharmas, references and publications of the dharma expounded by the Buddha, rules of Buddhism, and so on. The study of Buddhism refers to Buddhist scriptures, the origin, development, and timeline of Buddhist sects and schools, and the principles and philosophy within Buddha-dharma; all are investigated theoretically using the method of academic research. Buddha-dharma is the special dharma gates transmitted from the Buddha that can enable cultivators transcend the mundane world and enter holiness, methods to lead one into the practice toward liberation and to break away from mundane attachments, including mantras, visualization, mudras, mandala, dharma instrument, the three secret practices of body, speech, and mind, and utilization of the power of siddhi (accomplishment) within the dharma sphere. It is true that becoming a Buddhist disciple in the holy sense is not easy. However, that is the goal that every Buddhist disciple must pursue and also the only path of cultivating Buddhism toward liberation and accomplishment. Moreover, achieving that goal requires a pious devotion toward the Buddha, focusing the mind on goodness, and pure cultivation of one’s body, speech, and mind. Due to our rewards of good fortune accumulated through many lifetimes and eons, we live in this era with H.H. Dorje Chang Buddha III’s presence. Additionally, we also have the magnificent karmic conditions that allow us to closely follow H.H. Dorje Chang Buddha III in learning Buddhism. We can listen with our own ears the recorded dharma lessons expounded by H.H. Dorje Chang Buddha III and respectfully beseech the treasure books with dharmas expounded by H.H. Dorje Chang Buddha III. Moreover, many Buddhist disciples among us have personally received initiations transmitted by H.H. Dorje Chang Buddha III in person. How lucky and fortunate we are! What reason do we have for not diligently learning Buddhism and cultivating ourselves! We must make our vow to become a one-hundred-percent Buddhist cultivator with true faith and correct faith and strive to be Buddhist disciple in the holy sense with clear and pure cultivation. We must attain liberation and accomplishment in the current lifetime! Amitabha! 5. His Holiness Dorje Chang Buddha III is a Fellow of Britain’s Royal Academy of Arts, making Him the first internationally distinguished artist appointed to a Fellowship in the Academy’s history of more than 200 years. The title of Fellow was awarded by the Academy’s President, Phillip King, at a ceremony in the British Embassy in Washington. Author fabulousmomentPosted on July 16, 2017 Categories H.H. Dorje Chang Buddha IIITags Buddha, Buddhism, Buddhist, Buddhist Leader, Dorje Chang Buddha, Dorje Chang Buddha III, H.H. 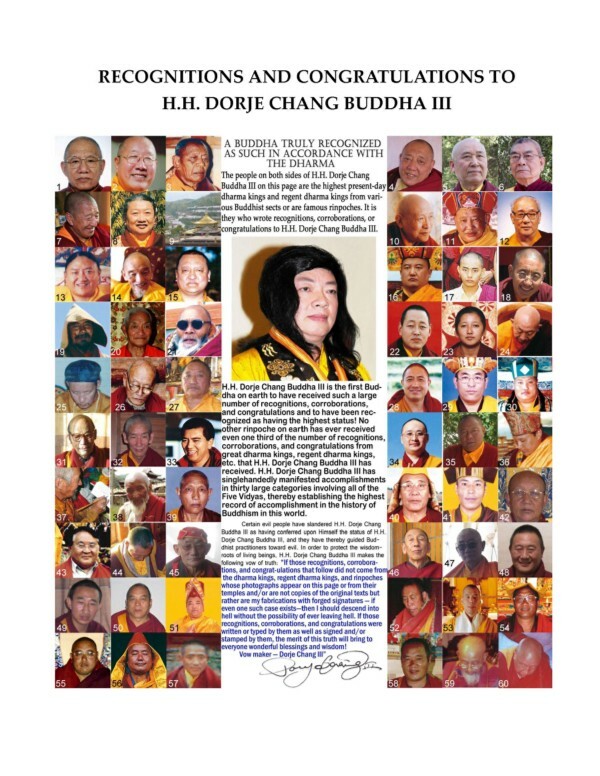 Dorje Chang Buddha III, His Holiness, His Holiness Dorje Chang Buddha IIILeave a comment on Who Is His Holiness Dorje Chang Buddha III?